VANCOUVER, BC – June 2, 2017 – Home buyer activity returned to near record levels across the Metro Vancouver* housing market in May. Residential property sales in the region totalled 4,364 in May 2017, a decrease of 8.5 percent from the 4,769 sales in May 2016, an all-time record, and an increase of 22.8 percent compared to April 2017 when 3,553 homes sold. Last month’s sales were 23.7 percent above the 10-year May sales average and is the thirdhighest selling May on record. 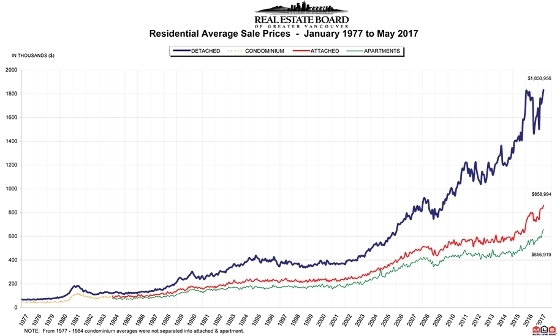 New listings for detached, attached and apartment properties in Metro Vancouver totalled 6,044 in May 2017. This represents a 3.9 percent decrease compared to the 6,289 units listed in May 2016 and a 23.2 percent increase compared to April 2017 when 4,907 homes were listed. The month-over-month increase in new listings was led by detached homes at 27.1 percent, followed by apartments at 22.7 percent and townhomes at 14.1 percent. The total number of properties currently listed for sale on the MLS® system in Metro Vancouver is 8,168, a 5.7 per cent increase compared to May 2016 (7,726) and a 4.5 percent increase compared to April 2017 (7,813). The sales-to-active listings ratio across all residential categories is 53.4 percent. By property type, the ratio is 31 per cent for detached homes, 76.1 per cent for townhomes, and 94.6 percent for condominiums. The MLS® Home Price Index composite benchmark price for all residential properties in Metro Vancouver is currently $967,500. This represents an 8.8 percent increase over May 2016 and a 2.8 percent increase compared to April 2017. Sales of detached properties in May 2017 reached 1,548, a decrease of 17 percent from the 1,865 detached sales recorded in May 2016. The benchmark price for a detached property is $1,561,000. This represents a 3.1 percent increase over May 2016 and a 2.9 percent increase compared to April 2017. Sales of apartment properties reached 2,025 in May 2017, a decrease of 5.8 percent compared to the 2,150 sales in May 2016.The benchmark price for an apartment property is $571,300. This represents a 17.8 percent increase over May 2016 and a 3.1 percent increase compared to April 2017. Attached property sales in May 2017 totalled 791, an increase of 4.9 percent compared to the 754 sales in May 2016. The benchmark price for an attached property is $715,400. This represents a 13.1 percent increase over May 2016 and a 1.9 percent increase compared to April 2017.